POUSSIN, NICOLAS (1594—1665), French painter, was born at Les Andelys (Eure) in June 1594. Early sketches attracted the notice of Quentin Varin, a local painter, whose pupil Poussin became, till he went to Paris, where he entered the studio of Ferdinand Elle, a Fleming, and then of the Lorrainer L’Allemand. He found French art in a stage of transition: the old apprenticeship system was disturbed, and the academical schools destined to supplant it were not yet established; but, having met Courtois the mathematician, Poussin was fired by the study of his collection of engravings after Italian masters. After two abortive attempts to reach Rome, he fell in with the chevalier Marini at Lyons. Marini employed him on illustrations to his poems, took him into his household, and in 1624 enabled Poussin (who had been detained by commissions in Lyons and Paris) to rejoin him at Rome. There, his patron having died, Poussin fell into great distress. Falling ill he was received into the house of his compatriot Dughet and nursed by his daughter Anna Maria to whom in 1629, Poussin was married. Among his first patrons were Cardinal Barberini, for whom was painted the Death of Germanicus (Barberini Palace); Cardinal Omodei, for whom he produced, in 1630, the Triumphs of Flora (Louvre); Cardinal de Richelieu, who commissioned a Bacchanal (Louvre); Vincenzo Giustiniani, for whom was executed the Massacre of the Innocents, of which there is a first sketch in the British Museum; Cassiano dal Pozzo, who became the owner of the first series of the Seven Sacraments (Belvoir Castle); and Fiéart de Chanteloup, with whom in 1640 Poussin, at the call of Sublet de Noyers, returned to France. Louis XIII. conferred on him the title of “first painter in ordinary,” and in two years at Paris he produced several pictures for the royal chapels (the Last Supper, painted for Versailles, now in the Louvre) and eight cartoons for the Gobelins, the series of the Labours of Hercules for the Louvre, the Triumph of Truth for Cardinal Richelieu (Louvre), and much minor work. In 1643, disgusted by the intrigues of Simon Vouet, Feuquiêres and the architect Lemercier, Poussin withdrew to Rome. There, in 1648, he finished for De Chanteloup the second series of the Seven Sacraments (Bridgewater Gallery), and also his noble landscape with Diogenes throwing away his Scoop (Louvre); in 1649 he painted the Vision of St Paul (Louvre) for the comic poet Scarron , and in 1651 the Holy Family (Louvre) for the duke of Créqui. Year by year he continued to produce an enormous variety of works, many of which are included in the list given by Félibien. He died on the 19th of November 1665 and was buried in the church of St Lawrence in Lucina, his wife having predeceased him. For Paris intellectuals Poussin produced during the ten years after his return to Rome the paintings which were regarded in his own time as his most perfect, and which are now considered to be among the purest embodiments of French classicism. To this group belong the second series of Sacraments, executed for Paul Fréart de Chantelou, a civil servant, between 1644 and 1648. The second series of Sacraments have a solemnity wholly lacking in the more picturesque first series. This is perhaps most apparent in the Eucharist, one of Poussin's most severe compositions. The scene is set in a room of the utmost simplicity, without ornament, and articulated only with plain Doric pilasters. 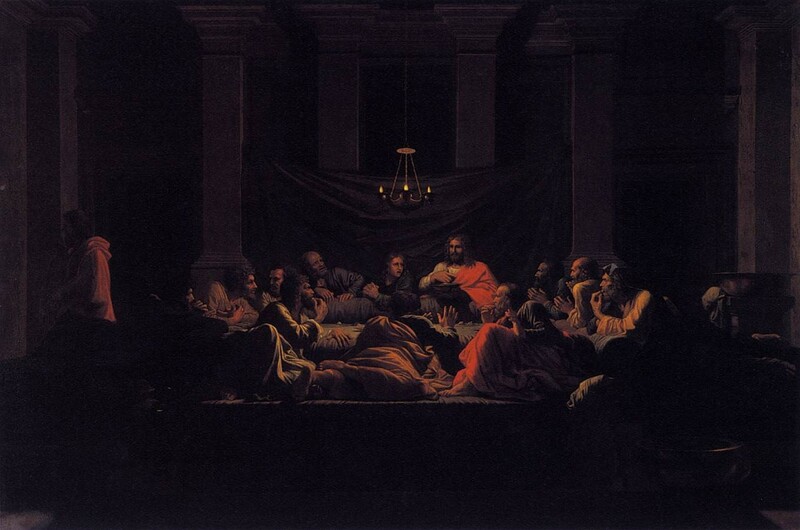 The apostles are shown lying on couches round the table and are dressed in Roman togas. The artist has chosen a moment which enables him to combine the two main themes which the subject involves: the dramatic and the sacramental. Christ has given the bread to the apostles and is about to bless the cup, but on the left of the composition we see the figure of Judas leaving the room. That is to say, Poussin represents primarily the institution of the Eucharist, but at the same time reminds the spectator of Christ's words: 'One of you shall betray me'. The double theme is made even clearer in the actions of the apostles, which are defined with great precision. Some are engaged in eating the bread, others show their realization of the significance of what is taking place by gestures of astonishment, while St John's expression of sorrow shows that he is thinking of Christ's words about Judas. Formally Poussin has concentrated his group into a symmetrical relief pattern. His choice of a low view-point has enabled him to foreshorten the front apostles, so that they form a compact group with those on the other side of the table.